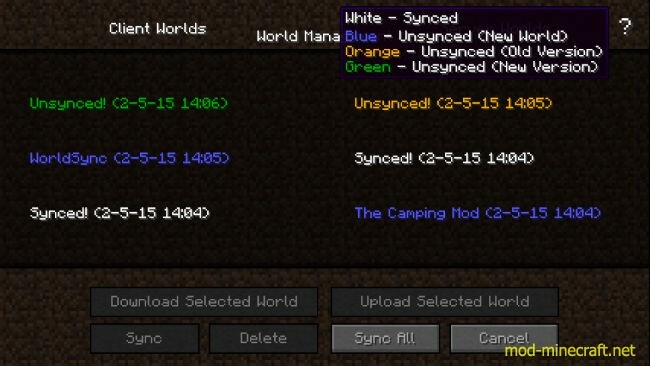 World Sync Mod unable you to play your worlds everywhere as long as there is internet connection by making easy syncing of worlds between computers and storing your worlds online from in-game. With World Sync you will never again lose another world. 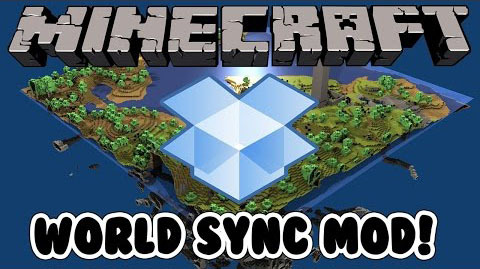 World Sync uses Dropbox to store and sync your worlds. 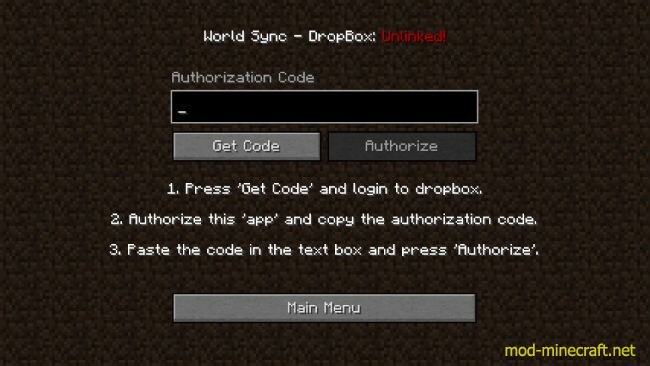 Upon installing World Sync you are required to link your dropbox account (no worries, the mod only has access to one directory created in the app folder in dropbox), this can be done by pressing the Dropbox icon in the main menu. 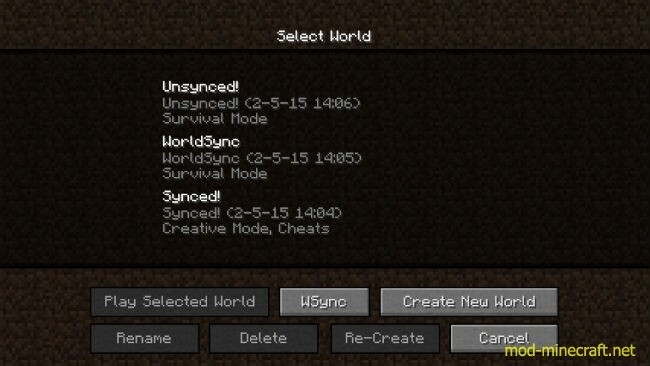 After linking your dropbox you will be able to upload, download and sync worlds, all from within Minecraft (a GUI can be found if the button: ?WSync? is pressed in the ?Select World? GUI). World Sync works with a client and server world data file containing the filename of the world and the time when the world was last played. 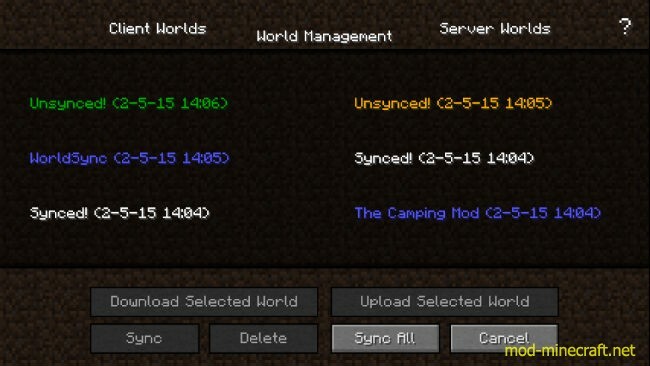 Upon entering the WSync GUI the server file is downloaded and will be compared with the client file, based on this new server worlds will be downloadable new client worlds can be uploaded and unsynced worlds can be synced. During these operations, the worlds are being zipped, when uploaded to the server, and unzipped, when downloaded. This is to make sure the operations will be executed as fast as possible (about 3 seconds) and the worlds will take up the least space in your Dropbox. 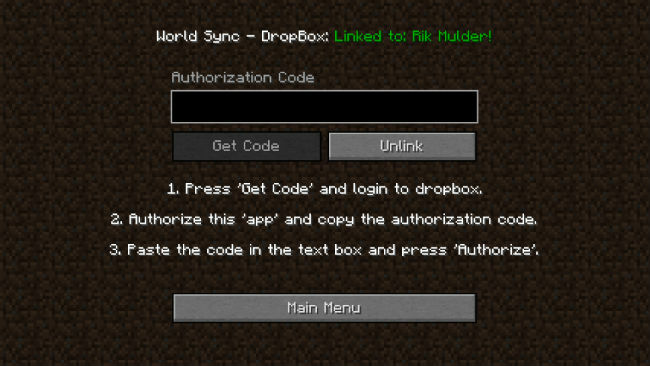 Furthermore when you link your Dropbox, it is linked to the currently logged user, so when you log in with a different Minecraft account ?your’ dropbox will not be linked and your online worlds are inaccessible. 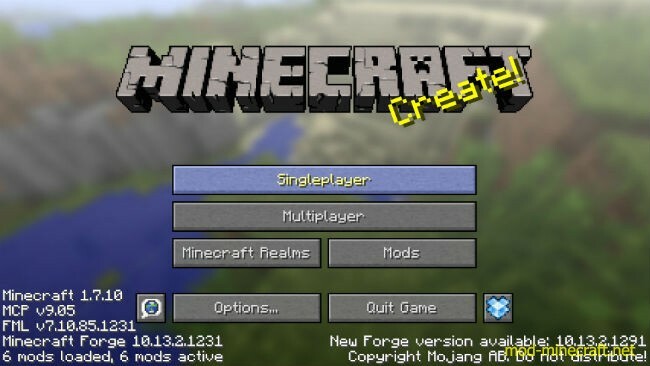 It is, of course, possible to link more Minecraft usernames to the same Dropbox but even then worlds uploaded with one account will not be accessible when logged in with a different account linked to the same Dropbox. Download the mod and RikMulds Core.